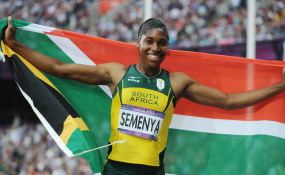 The South African Sports Confederation and Olympic Committee (SASCOC) has come out in full support of Athletics SA's decision to challenge the IAAF on its move to introduce testosterone blood levels in five female athletics disciplines. Last week the IAAF amended their classification for "female of intersex (or equivalent)" athletes with elevated blood testosterone levels, applying to those competing in the 400m, 800m, 1500m, mile and 400m hurdles. The new ruling, which is due to come into existence on 1 November, is widely expected to affect South African superstar Caster Semenya. The President of SASCOC, Mr Gideon Sam, welcomed ASA's decision to challenge the IAAF, and if required, take its case to the Court of Arbitration for Sport (CAS). "As the parent body of our member federations, we needed to take the lead from ASA in this case, and are fully supportive of their decision to engage with athletics' governing body, the IAAF, going forward. We were deeply disappointed when the IAAF made their ruling, and we simply can't stand back and allow Caster's name to be dragged through the publicity mill yet again. The protection of our athletes and their dignity is of utmost importance. 'We continue to produce high quality sportsmen and women and as the mother body to ASA we can assure them that they have our backing all the way,' Mr Sam added. SASCOC has committed to engage with both ASA and its HP Commission to conduct a detailed analysis into the ruling and the debate around such. The process is already at a stage where the SASCOC HP Commission is putting together a group of experts, under the chairpersonship of the Chair of the SASCOC Medical Commission, to drive this process and advise the SASCOC Board. Dr Phatho Zondi is the chairperson of SASCOC's Medical Commission, and a proposal to establish an Advisory Committee has been supported. The committee would compromise of professionals that include a sports physician, legal council, endocrinologist, and sports scientist. The experts would throughly investigate the IAAF ruling and provide advice to SASCOC on a proposed course of action going forward, with an understanding of the relative urgency of such an investigation. Read the original article on Sascoc. Copyright © 2018 South African Sports Confederation and Olympic Committee. All rights reserved. Distributed by AllAfrica Global Media (allAfrica.com). To contact the copyright holder directly for corrections — or for permission to republish or make other authorized use of this material, click here.